September 2018 – We became residents of South Dakota over eleven years ago, but it was our travels through South Dakota last year and this year that gave the state a special place in our hearts. 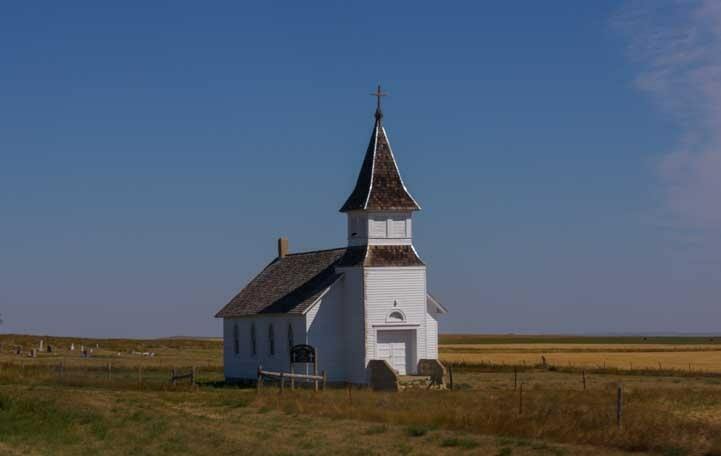 Little church on the prairie. 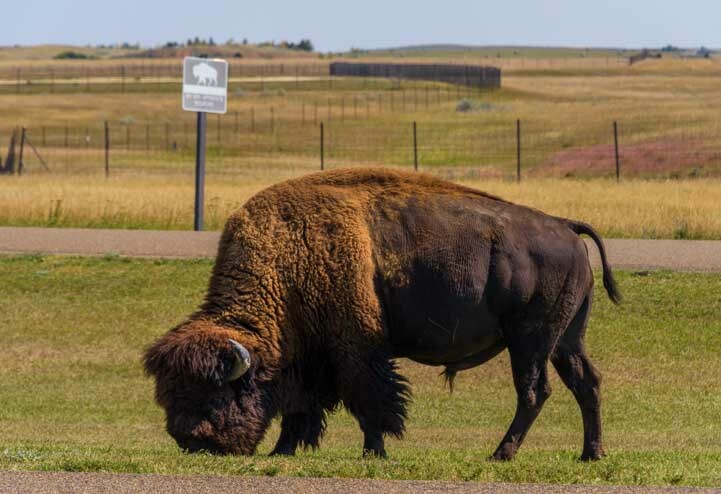 Between the beauty of the Black Hills, the tame wildlife in Custer State Park, the remote pretty scenery and cozy friendliness of tiny Buffalo, there was a wholesomeness everywhere that was deeply appealing. 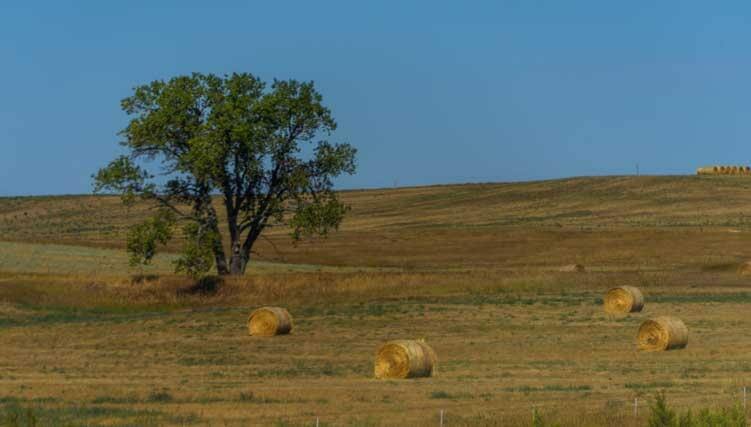 We continued our travels on South Dakota’s back roads as we headed north from Buffalo. The wide open prairie stretched out on either side of us, dotted here and there with farmhouses and rows of silos. There were hay bales everywhere. Modern farm equipment rolls the hay into enormous round bales — the old small rectangular hay bales are long gone! — and these big rolls were scattered about across the plains. Haying was in full swing and hay bales were everywhere! Not exactly the old family farm any more! Once in a while we passed a small creek or stream, but for the most part the landscape stretched out to the horizon in amber waves of grain. 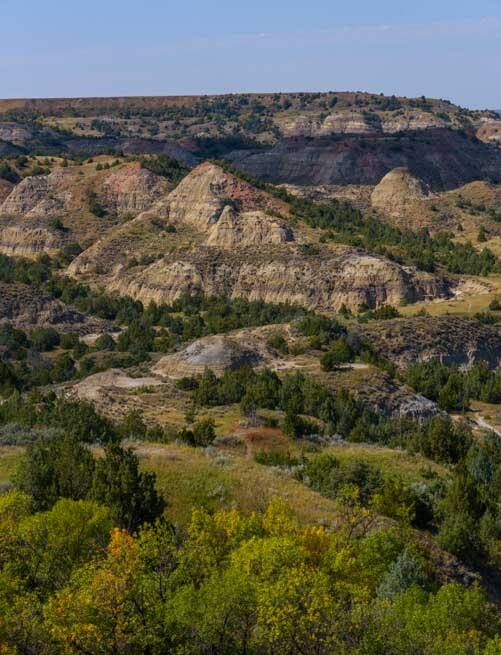 Theodore Roosevelt National Park lies in southwestern North Dakota, just over the border of northwestern South Dakota. 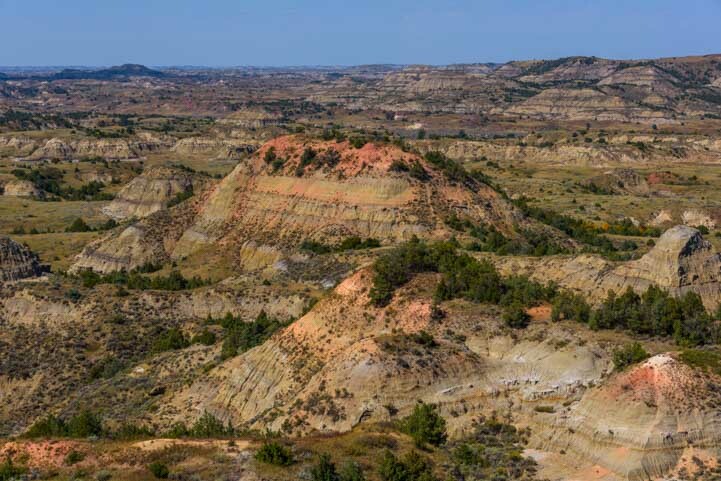 This Park is filled with badlands, eroded sedimentary rock that has been carved by the Little Missouri River and its tributaries. We were looking forward to photographing the teepee shaped rock formations and hadn’t thought much about the kinds of wildlife we’d see. 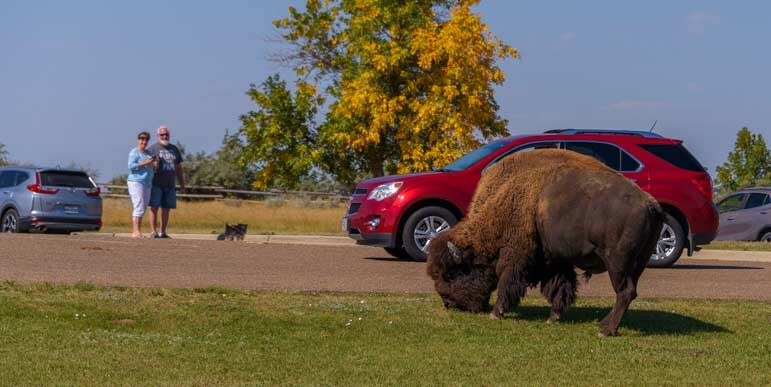 So, it was a huge surprise when the official Roosevelt National Park Greeter welcomed us with a sway of his huge head and grass hanging out of his mouth, right at the Painted Canyon Visitor’s Center parking lot! Theodore Roosevelt National Park has a unique Greeter at the Visitors Center! 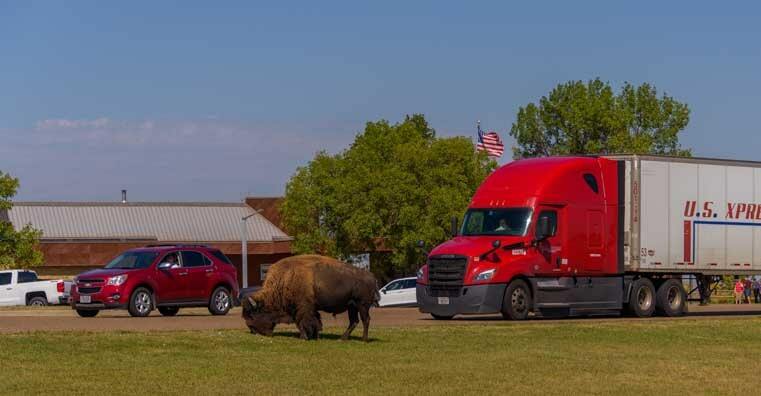 Fortunately, he was paying more attention to the grass than he was to his job as a Greeter, so cars and trucks were slowly pulling alongside him to get photos. A few of us got out of our cars to snap a shot or two. Never mind the impressive badlands scenery. Get a pic of that buffalo! I loved it when he wandered over towards a sign with an image of a buffalo on it that said, “Do Not Approach Wildlife.” Yes, siree! We stayed well away and were grateful for our long lenses! 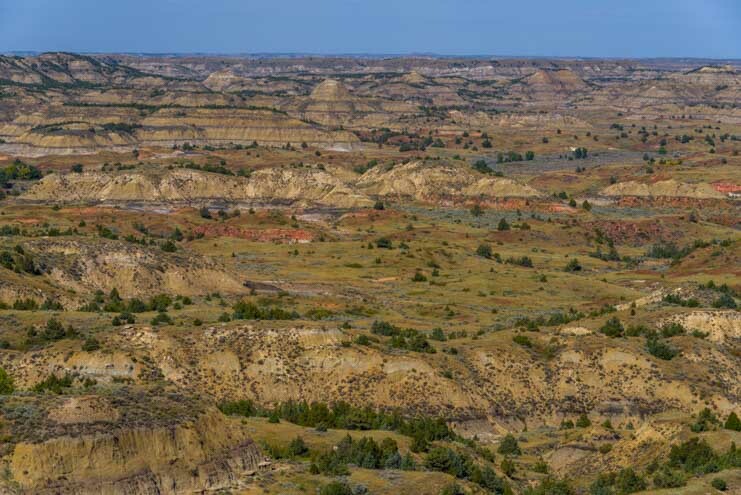 Teddy Roosevelt National Park has two units, North and South, and the Painted Canyon is in the South Unit. The park was established and named for President Roosevelt (1901-1909) in 1947. 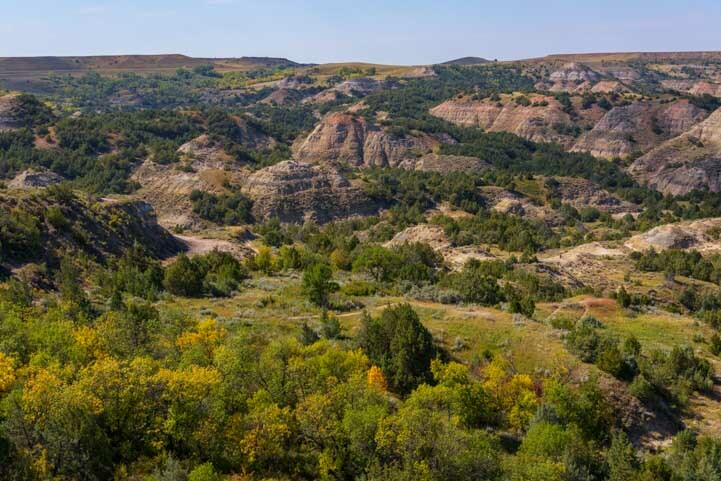 As a younger man Roosevelt had purchased a cattle ranch in North Dakota a bit south of Medora, the town that anchors the South Unit of the National Park. Roosevelt’s ranch was located 10 miles from his nearest northern ranching neighbor and 12 miles from his nearest southern ranching neighbor, just enough space for a man to breathe freely away from the crowds. Both Roosevelt’s wife and his mother died on Valentine’s Day of 1884. What an unimaginable blow! The following summer he started a second ranch nearby which he called the Elkhorn. This became his home ranch where he spent most of his time. In 1918 Roosevelt commented, “I have always said I never would have been President if it had not been for my experiences in North Dakota.” It certainly cemented his love for wild places and the outdoors. Teddy Roosevelt is the president who pioneered the concept of preserving natural areas. Not only did he established the US Forest Service and sign into law the 1906 Antiquities Act under which National Monuments are created, but he established five National Parks and 150 National Forests. There’s a lovely hike right from the visitors center. As we wandered along the trails at the Painted Canyon Visitors Center, we noticed to our complete surprise that the leaves were already beginning to change color. Even though Labor Day was barely behind us, Fall was starting. All summer long as we enjoyed the very cool mountain weather in Montana and Wyoming, we stared in disbelief at the baking hot crimson temperature maps of America and saw the rest of the country was sweltering. Even though the Upper Peninsula remained relatively cool because of the cold waters of Lake Superior, the hundreds of miles between “here” and “there” would take us through lots of miserable summer heat. 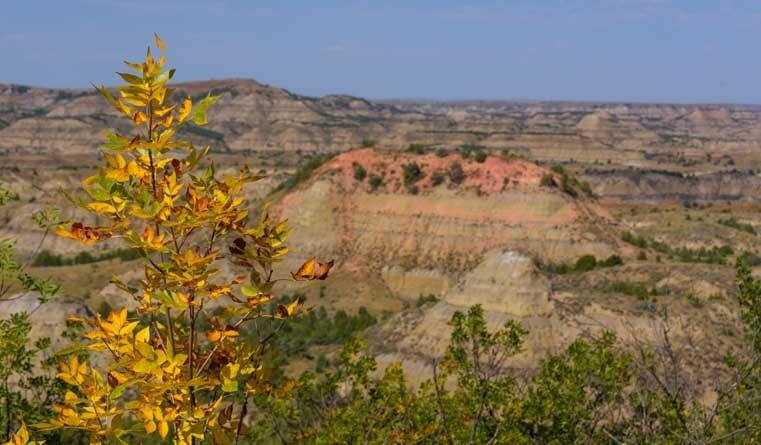 However, when we saw the fall leaves in Roosevelt National Park beginning to turn, we panicked. I instantly hopped on the internet to find out exactly when the leaves peaked in Michigan’s Upper Peninsula, and one site said it was September 17th. Holy Smokes!! 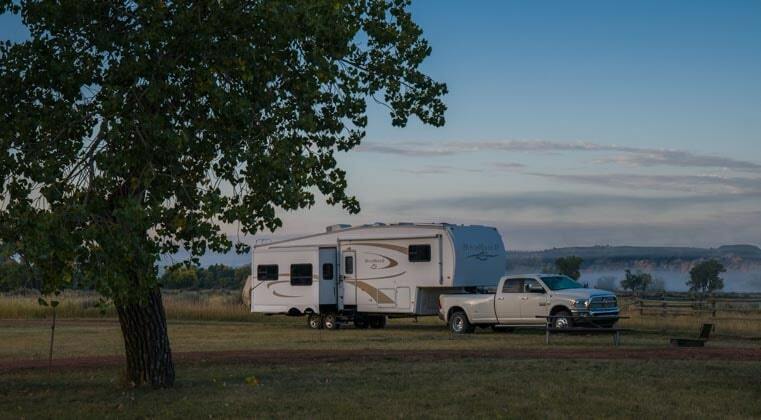 We dropped all plans of exploring Teddy Roosevelt National Park’s North and South units and the intriguing sounding petrified forest nearby, and we jumped on I-94 East in an all-fired rush to get to Lake Superior. 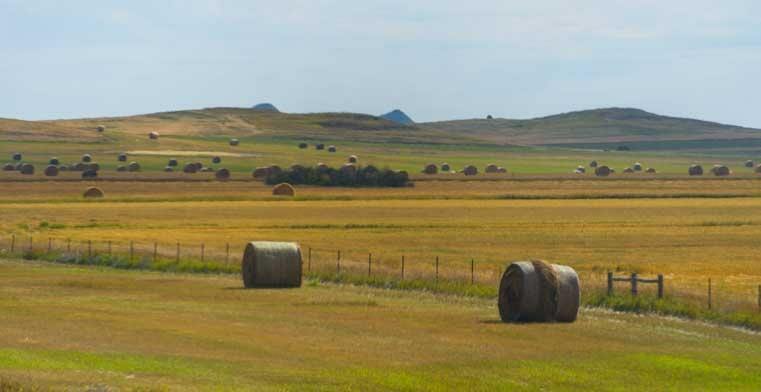 Even up on I-94 we kept seeing round hay bales in the wide open prairie. 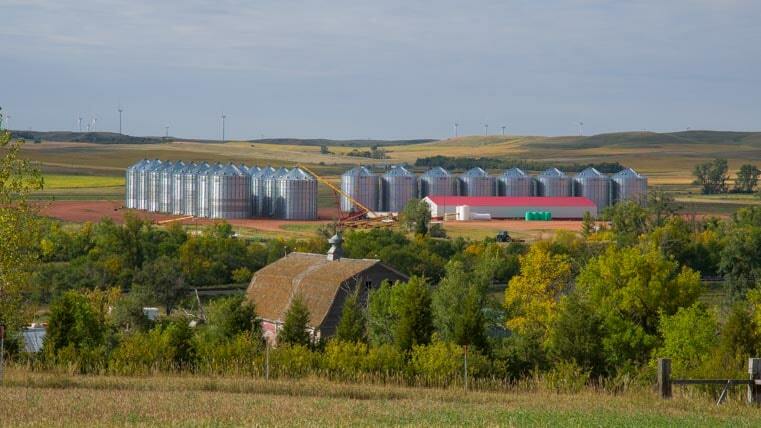 A rare single silo farm. Despite traveling on the interstate, we still had wonderful views of the Northern Plains. Hay bales were still scattered everywhere and grain silos stood like battalions of soldiers stationed every few miles. 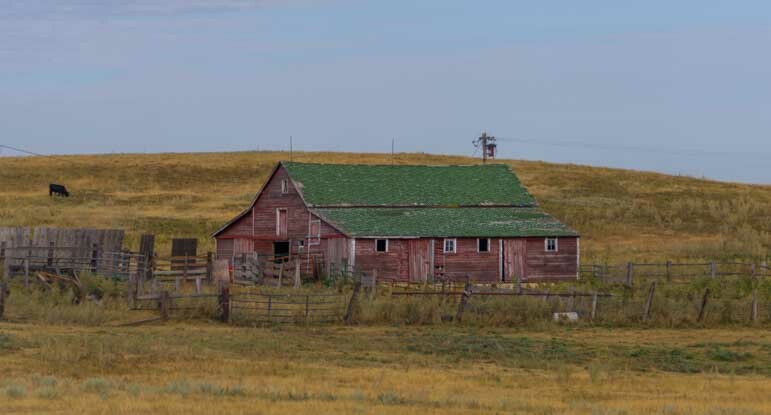 Once in a while we’d catch a glimpse of the farming style of old, perhaps from the days not too long after Teddy Roosevelt did his cattle ranching in the area. The way it used to be, perhaps not long after Roosevelt’s day. We had been planning to spend a few weeks in North Dakota, and I had highlighted quite a few spots on the map that would be fun to see. One is the Enchanted Highway, a stretch of road that runs north-south through the prairie off of I-94. 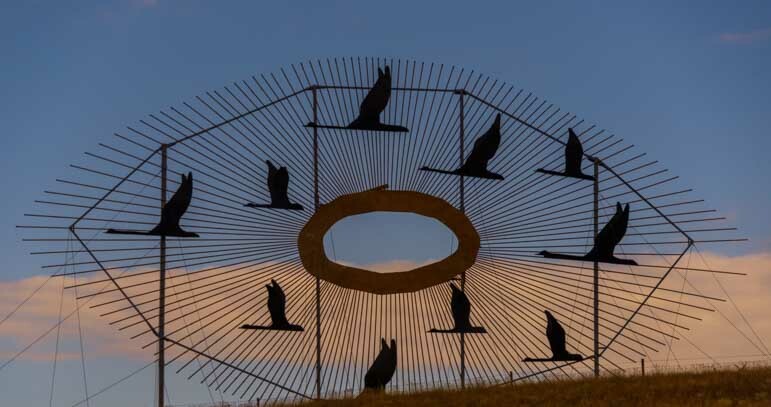 The Enchanted Highway is special because of seven enormous metal sculptures that have been erected amid all those amber waves of grain. The first one — Geese in Flight — was visible for a split second from I-94, and we got a glimpse of it at 65 mph as we flew past. 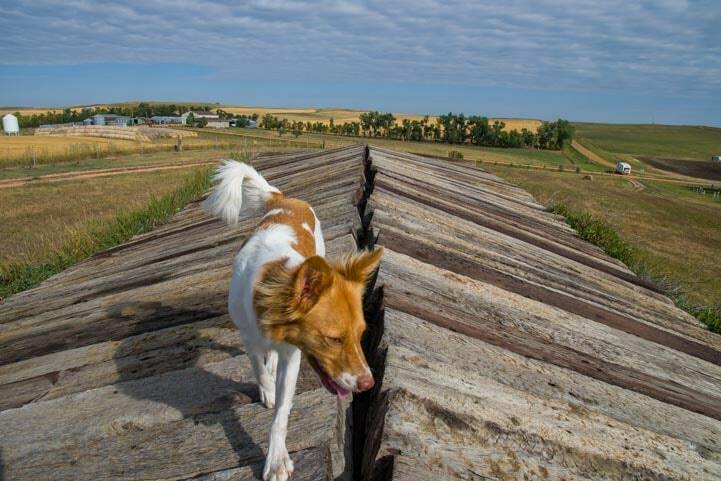 The Enchanted Highway, along with the rest of Roosevelt National Park and half a dozen scenic drives, will all have to wait for another visit. In the meantime, North Dakota sailed past our windows. Although we didn’t see the the other six Enchanting Sculptures on the Enchanted Highway, we did see an enormous cow on a hill in the distance. A mammoth cow offered a bit of enchantment on I-94. When we do massive, long distance travel with our trailer in tow (250 miles in a day is “massive” for us in our trailer these days), we like to start before breakfast and then make pit stops for breakfast, a morning walk, lunch, an afternoon walk, and so on. That’s probably what makes these not-so-very-long mileage days seem “massive.” We stop at least once every hour! I was busy staring out the window when Mark suddenly exited the highway. Since he had a smirk on his face I pretended I knew exactly what he was up to. But I was quite alarmed when he drove down a long country lane without saying anything. Finally, I couldn’t stand it any longer and had to ask him where the heck we were going. “I saw the sign for Fort Sauerkraut and I just had to go see what it is!” he said. 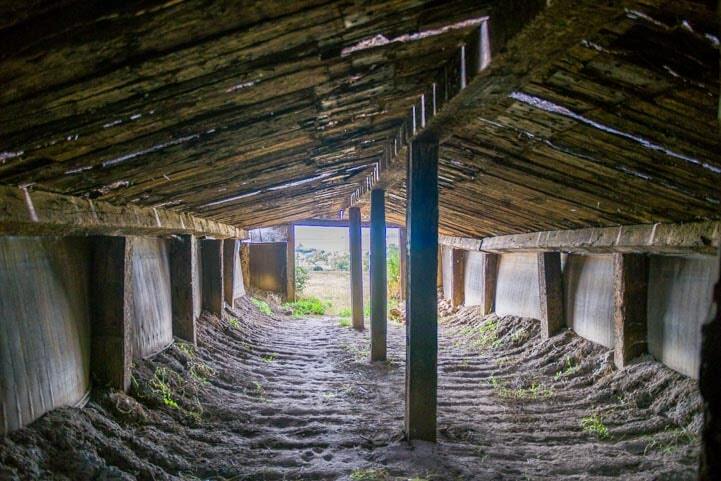 It turned out that the remains of Fort Sauerkraut was a small wooden building built into a hillside. The fort was built to give the people in the area a place to hide from an anticipated Indian raid. Fortunately, the raid never happened, so the fort never had to be used. However, the story goes that a bunch of pigs discovered the hoard of sausages that had been buried in anticipation of the raid, and they ate them all! Buddy might have been hunting for yummy food scraps too as he scampered across the roof. Buddy checks out the roof of Fort Sauerkraut. Inside the fort was rather barren. The plan was just to give the families in the area a safe place to hide out for a short time. Luckily the fort never had to be used. On a plaque outside the fort there is a long and detailed description of the months and years surrounding the fort’s creation in 1890. The history was written in 1933 and it brought to life the intense fear and mistrust between the Indians and the settlers in the late 1800s. There was good reason on both sides to be petrified of the opposition, yet at the same time the legends of the American West were already being canonized by its star players abroad. Indian Chief Sitting Bull had toured the big cities of the eastern states and Europe alongside Buffalo Bill Cody, bringing the exotic American Wild West to distant urbanites. When he returned he brought his own observations of those far-flung lands home to his people. 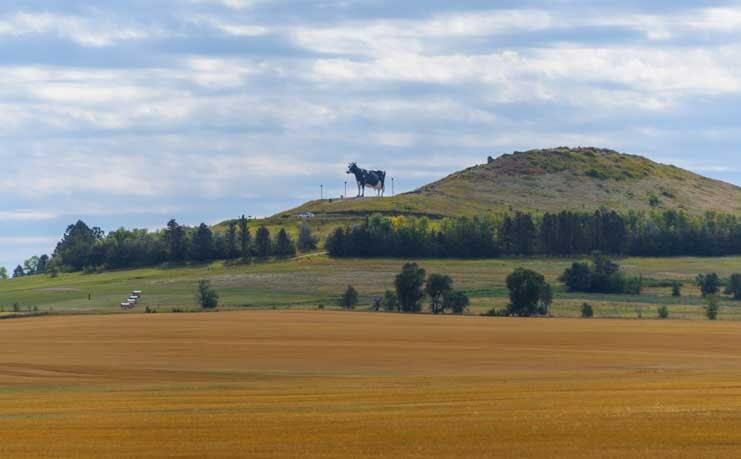 Interestingly, it was the widespread fear that Sitting Bull was planning to lead a raid into this part of North Dakota, despite (or because of) his retirement from shows and touring, that made the local farmers and ranchers erect the fort. Nowadays the view from the hill where the fort stands takes in nearby grain silos in the direction the Indians were expected to come. Our trailer was parked at the bottom of the hill on the opposite side. The view from Fort Sauerkraut today. Fort Sauerkraut is on the edge of the town of Hebron which is known as the Brick City. As we walked through this very quiet town I noticed a gourmet coffee shop. Yay!! 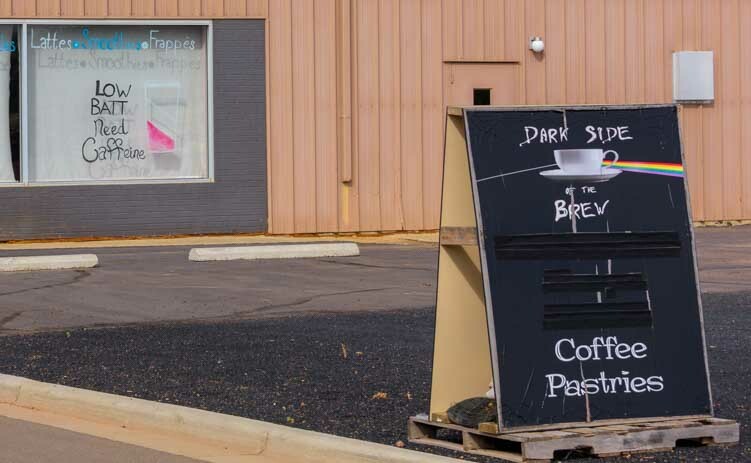 We got lucky and found yummy espresso and baked goodies at Dark Side of the Brew Coffee in Hebron. I asked her what the grain was that we had been seeing for the last few hours and she said it was wheat. She further explained that the big employers in town were the wheat mill and the brick company, but that nowadays most folks commute to Bismarck or Dickinson. What would those settlers and Indians of 150 years ago think? For them it was a long long horseback ride to get to Bismarck, and in the days of Fort Sauerkraut there weren’t many roads to Hebron. Most folks took their horses and buggies right across the prairie, even in the dead of night when an Indian raid was expected! We never really know where our travels will take us, but it’s always good! Another few long days at 65 mph on the road would get us to Lake Superior. Luckily, once we arrived and started asking around, we discovered that the fall colors in northern Michigan extend all the way from late September to late October. We probably didn’t need to rush so fast across country to get to this big lake. On the other hand, we were thrilled to see something new and completely different, and the Indian Summer temps on our arrival were absolutely ideal.